CENTERBROOK — The selection committee for the Carolyn R. Greenleaf Memorial Fund of Community Music School (CMS) has chosen guitarist, vocalist, and pianist as the recipient of the Spring 2017 Carolyn R. Greenleaf Music Award. This award is given each semester to a middle or high school student who has demonstrated exceptional musical ability and motivation. 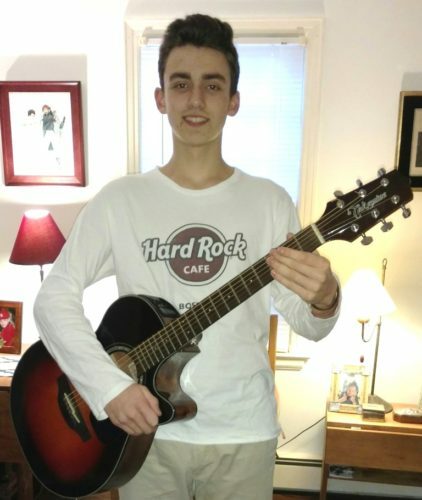 The award is for a semester of private lessons at Community Music School in Centerbrook and Santiago has chosen to study guitar with CMS’s guitar instructor, John Birt. An Honor Freshman of Xavier High School, Santiago received his first guitar from his grandmother when he finished first grade, and he’s been playing unstoppably since then. He has attended CMS since 2012, as a guitar student of John Birt for the last four years. He also studies piano and voice with Greta Moorhead and recently joined the Jazz Ensemble with Tom Briggs. His favorite band is The Beatles. Outside of CMS, he has played in musicals at St John School in Old Saybrook, performing as a solo singer in last year’s performance. Aside from music, he enjoys soccer, basketball, and archery. Santiago is also an avid photographer and has received many awards at the Chester Fair. Last summer he volunteered in the children’s section of the Essex Public Library and has been a big supporter of the Valley Shore YMCA’s Community Garden which provides vegetables for the Shoreline Soup Kitchens & Pantries. The Carolyn R. Greenleaf Memorial Fund was established at the Community Foundation of Middlesex County in 2008 by her friends to honor Greenleaf’s dedication to music and education. The Carolyn Greenleaf Memorial Music Award is open to students of Middlesex County and the Lymes and is awarded twice a year. It is entirely based on merit and is the only such award at Community Music School. Community Music School is an independent, nonprofit school which provides a full range of the finest possible instruction and musical opportunities to persons of all ages and abilities, increasing appreciation of music and encouraging a sense of joy in learning and performing, thus enriching the life of the community. Community Foundation of Middlesex County is a nonprofit organization dedicated to improving the quality of life in Middlesex County. Working with charitably-minded individuals and organizations to build permanent endowments since 1997, the Community Foundation has provided 850 grants totaling more than $2.5 million to organizations for the arts, cultural and heritage programs, educational activities, environmental improvements, and for health and human services.